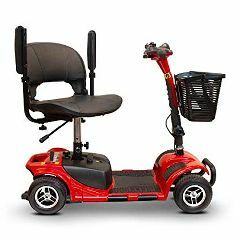 AllegroMedical.com presents The EW-M34 4-Wheel Portable Mobility Scooter. The search for a high quality, practical indoor scooter just got easier! Introducing the E-Wheels M-34 portable mobility scooter. The EW-M34 is packed with value and has the longest range and lightest weight of any travel scooter on the market today!